If you or a loved one has been in a motorcycle accident then you need to consult with Motorcycle Accident Attorney at Jardine Law Offices in Salt Lake City. When a motorcyclists ride goes wrong the risk is greater than if someone were in a regular vehicle. The summer is the perfect time to get out your motorcycle and ride. Typically those rides happen on the weekends or evenings. When you head on your bike it feels like the freest thing in the world. The wind is in your face, you feel all the elements. The sun warms your back as ride away from the sunset. Motorcyclists are a special breed. They tend to stick together and obsess over the choice in motorcycles. However, they all band together to ensure that they are seen. When motorcyclists ride in groups they are supporting each other. Before the ride, they get together sharing experience and choosing you will be riding which position and in what formation. Much like any activity, there is safety in numbers. Cars already have a hard time noticing one bike, so why not get into a group to ensure that all are seen? Motorcyclists are also provided safety classes with suggestions for safety gear. If you choose to ride a bike then you need to be smart about what you are wearing, where you are riding, and who you are riding beside. Frequent stops and breaks are important because as fun as a motorcycle is to drive, it can get really exhausting. If you do not ride a motorcycle then all this information may seem foreign to you, maybe even a little excessive. The truth is, a lot of rumors are told about motorcyclists. These rumors suggest that cyclists are rude or they don’t respect the road. However, to ride a bike safely then you must respect the road more so than a car driver because there are more risks to consider. Unfortunately, in Utah, our motorcycle accidents are on the rise. In 2018 there were more accidents in the first six months of the year than in the past 5 or so years. This is not an increasing trend we in Utah want to see. 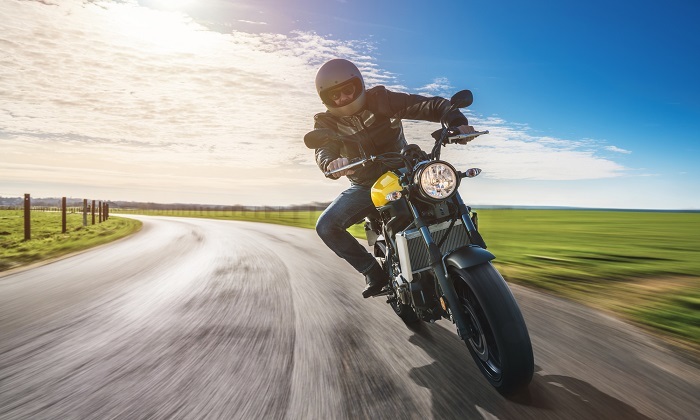 If you or a loved one has been in a motorcycle accident then you need to consult with our Motorcycle Accident Attorneys at Jardine Law Offices in Salt Lake City. When a motorcyclists ride goes wrong the risk is greater than if someone were in a regular vehicle. For example, a man who was riding met an expected road full of cows. He was driving too fast to slam on his brakes without getting injured so he swerved to hit the herd. However, he managed to hit one cow just hard enough to crash his bike. Subsequently, his bike blew up in flames, thankfully he was not injured because he was wearing the proper gear. But we know that this isn’t always the case and just because you ride with more risk does not mean that you do not deserve to be compensated for your injuries if it was not all your fault. Call 801-350-3506 or click here to reach out to our Motorcycle Accident Attorney at Jardine Law Offices in Salt Lake City. If you were in an accident you need someone who actually cares and believes in your right to ride.